Every monday night is mono printmaking at Garance’s magical studio in New Suffolk, NY. And give the Printer (Garance) your work. She will allign your piece on her press, measuring under her breath in Swiss-German, and through the heavy metal roller it goes. What comes out on the other side is: a surprise, each time. I have always wanted learn the constellations, but the classroom was never available in NYC. But here, on the North Fork, on any clear night, it is open. Draco, Ursa Minor, Ursa Major, Cepheus, Cygnus, Lacerta, Cassiopeia, Lynx, Camelopardalis, Perseus, Gemini. This 10×10 painted board will be on sale at the South Street Gallery’s 10×10 art sale which benefits the North Fork Environmental Council. PREVIEW: Friday, December 1, 2017 noon-9pm; SALE BEGINS: Saturday, December 2, 2017, 6pm. I am using a Kindergarten art technique: toothbrush splatter art. My most formative years. or, take the trains to the stations shown on the map and walk west to the park and the ship. “Between 1941 and 1945, Liberty Ships were constructed in 18 U.S. shipyards. John W. Brown is one of only two Liberty Ships that survive. “She is docked at Pier 36 on the Lower East Side (299 South St.) and is open for tours and other events ending with a six-hour living history cruise on Sept. 18. …and love internet searches. Are you in need of a good title for a talk or presentation? I am! 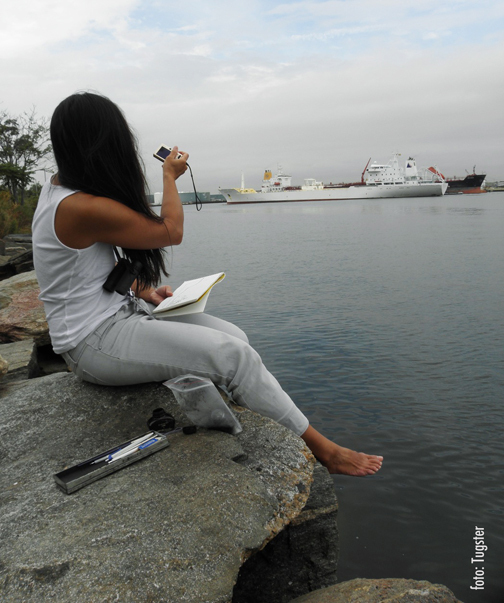 Next week, I am invited to speak on the Nantucket Lightship, WLV-612, on my New York Harbor Sketchbook drawings. They recommend a few sites for generating titles using your keywords, so, I tried them all. • What Will Historic Ships Be Like In 100 Years? how sublime. I could never make anything so perfect up! This site is the perfect reason to skip college and run to sea. 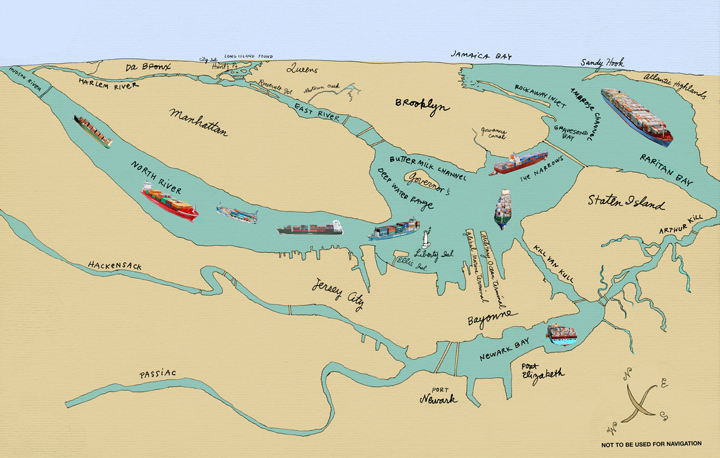 • Why Do People Think New York Harbors are a Good Idea? 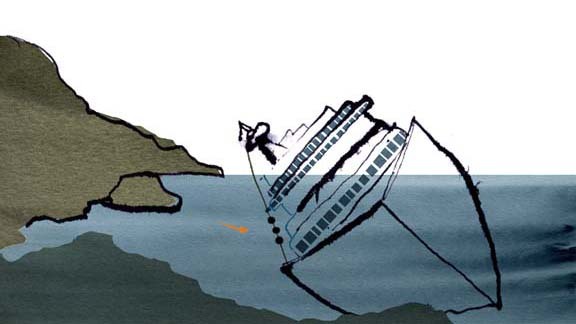 • Do You Make These Common Historic Ship Acquiring Mistakes? well! they are all winners. How DO I pick? which do you like? As theoretically, the last frost is over, even though one still freezes one’s derrière off, the peepers optimistically begin their nocturnal calls, the earthworms churn the softening ground, and the crimson clover seeds have been sown. Make use of the rains as water costs and rain is free. The more crimson clover, the less lawn to mow, weed and water. A no-brainer. Also known as Coney Island Whitefish Moon. While on the topic of Coney Island Whitefish, please dispose of condoms properly. Do not fling them into the water! Hello—I’m talking to YOU. I’m delighted you are using protection, but please put it into the trash where it can wash into the waters through official channels. Insert-Libation-Of-Your-Choice-Here Moon. Fire up the grill, swirl around in your sun dress, imbibe and howl at this new moon. Don’t drink and drive: jump into the bay instead. As jellyfish fill the bay, and bathers get stung, the smell of first-aid vinegar laces the sweet soft briny zephyrs. As the Natives know: when the jellyfish are in the bay, they are not in the Sound. When they clog up in the Sound, you’re safe in the bay. And in both, the fertilizer run-offs will give you ear infections. Do not use vinegar in ear. Lyme Tick Dropping Moon was too depressing to name this beautiful new moon. Deer may run amok and feed the ticks, but it is the white-footed mice which are the key hosts of the virus which go into the ticks. So don’t get guinea hens, get a fox. Add some wolves, coyotes and bears, too. The New York City Council’s Committee on Waterfronts will hold a hearing on Tuesday, May 3, 2016 at 10:00 a.m. in the 14th Floor Committee Room, 250 Broadway, New York, NY. Hey, Cityfolks! even those living in waterfront condominiums will need food and goods brought in and wastes removed. Can’t keep trucking. does anybody else in here feel the way I do? Vera K is now Bobbie Ann; Vera Lynn is still active! Tough gals, the two Veras. I’m not making this up! click here: this is the Pregerson Interchange in LA, CA, blowspittled. It seems there was once a St. Nicholas Lightship, in Lowestoft, Suffolk, England. Click to see a rich brocade of St. Nicholas images from the old gCapt Maritime Monday magazine of MonkeyFist. In March of 1946, several war veterans living in East Marion wanted a memorial to honor the memory of their fallen neighbors. 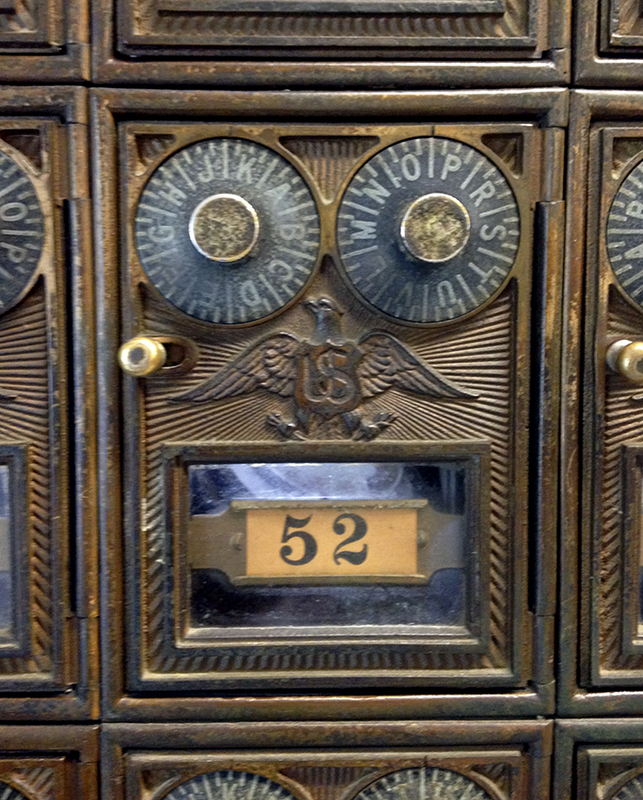 They decided to create the only War Memorial Post Office in the United States. A piece of land was purchased in April (for $1500), they went from door to door to raise the funds to erect a building, and after a year, many volunteer hours and $7000 later, a memorial building was built. There is a metal plaque for veterans of “the World War,” 1917 – 1919. 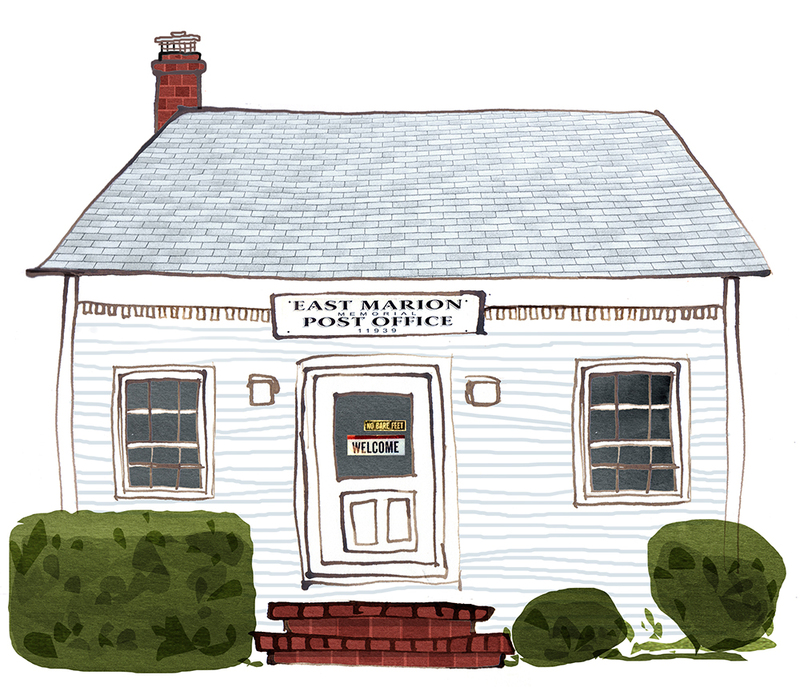 In May of 1999, Congress officially recognized and re-dedicated this little post office to war veterans. 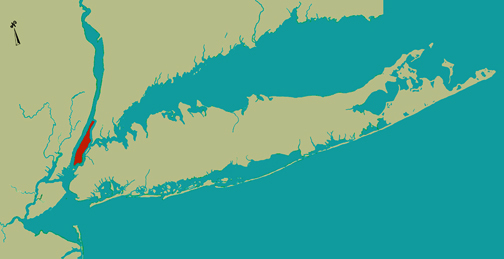 I have moved from NYHarbor, and now live in East Marion, the North Fork of Long Island, NY. I bike to Greenport and Orient for boats and ferries. I can swim in the Sound (water temperature 60°F / 15.5°c now, a bit warmer in the bay.) And I pick up my mail from the East Marion Post Office War Memorial. 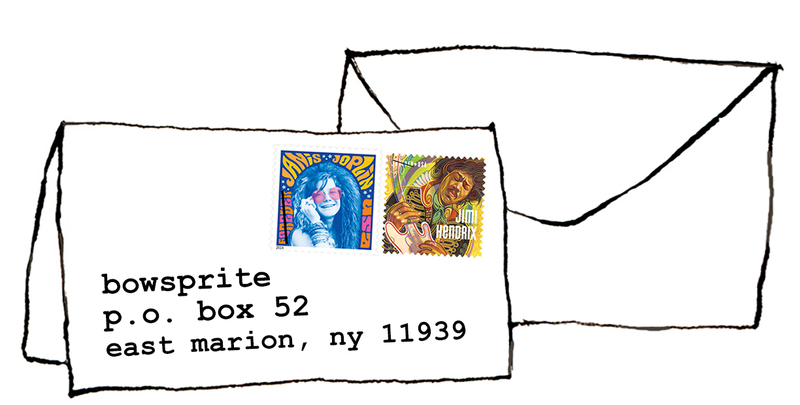 Janis and Jimi might agree. “For the love of french, add curlicue L and apostrophe,” requests Tugster. 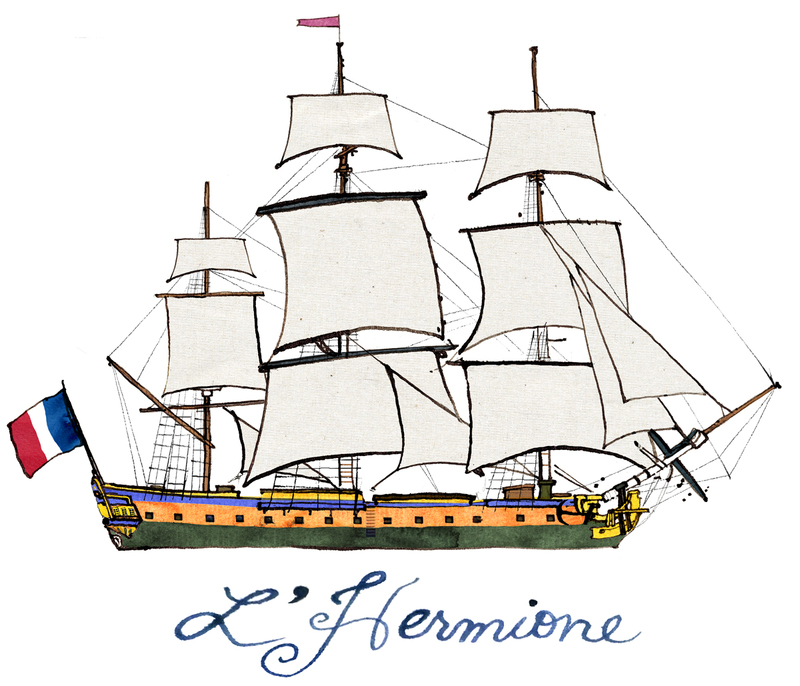 “AIS shows her as lhermione,” he adds. 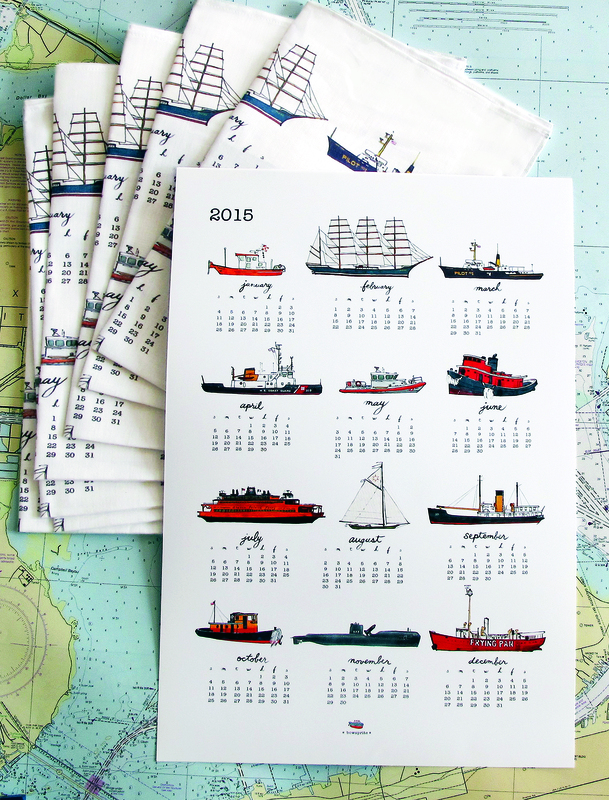 I will be selling ship schwag at Blue Ruth 29 Front Street, 4 and 5 July. It is so exciting to have the ships in town, and friends who sail, buzzing around. 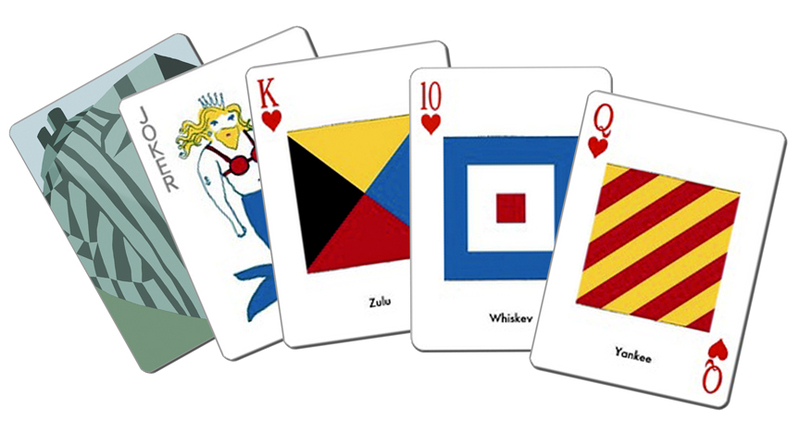 Sailors do tell the best stories, especially when imbibing happy-inducing libations. I’m looking forward to people watching while keeping watch. Happy happy July, All! Tugster and I, with other Rotten Apple harbor rats, will be attending the International WorkBoat Show this week, 3 – 5 December. Will you be around? drop a line! Rendezvous with the Cap’t of the Crewboat Chronicles and WorkBoat Wear, first! And then, I desperately want to go to the National WWII Museum. Happy Veteran’s Day! In honor of our seafaring veterans, I’ve got a real treat. I stumbled acrossBowsprite’s booth at last year’s National Stationery Show and was immediately enchanted with the sea-kissed line. 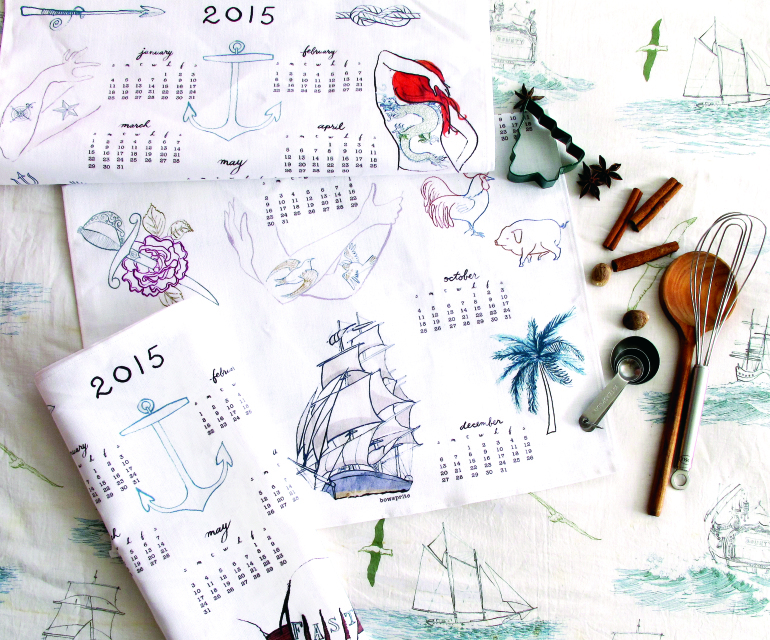 First up is this engaging and artful array of nautical tattoos, available as a tea towel printed on Irish linen. 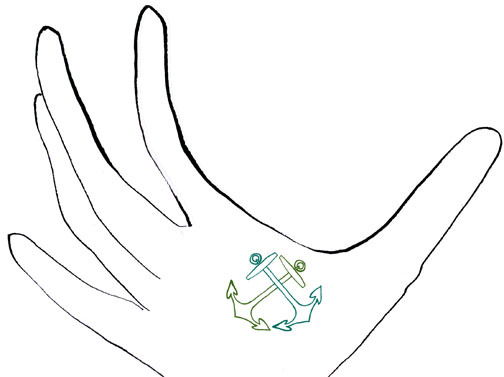 Each tattoo has its own meaning — “Hold Fast” across the hands was meant to give a sailor good grip in the rigging, while an anchor tattoo signifies that a sailor had crossed the Atlantic, or is a Merchant Marine. $20. Miss January is the hydrographic survey vessel Michele Jeanne — also Christina’s first deckhand job! July meanwhile is the Staten Island Ferry John F. Kennedy, 1965. There are lots of maritime treats to be found in Christina’s Etsy shop, so check it out! 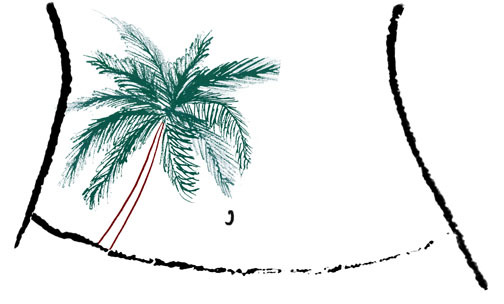 It is so easy to get lost in her lovingly rendered visions of the sea-salty life. Are you a Vet? do you know someone who is? write me for a Veteran’s special on items in my shop. If you have served at sea, drop me a line: what vessel? where were you? what would you like to tell about your time in service? 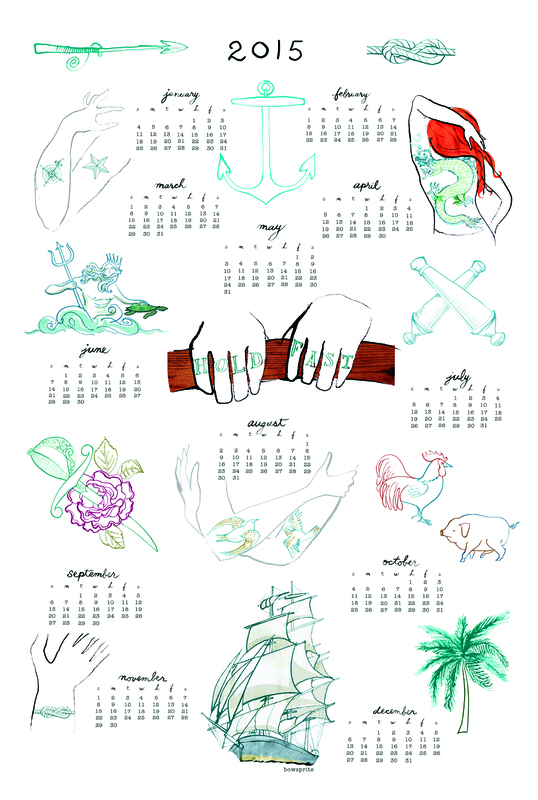 Nautical tattoos posted upon by Owen James Burke of the Scuttlefish! 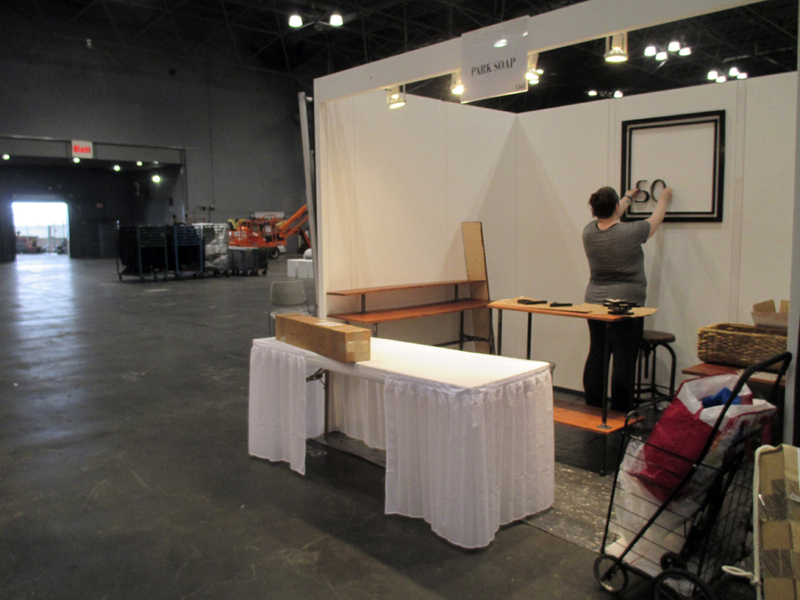 Today begins the National Stationery Show at the Jacob Javits Center. 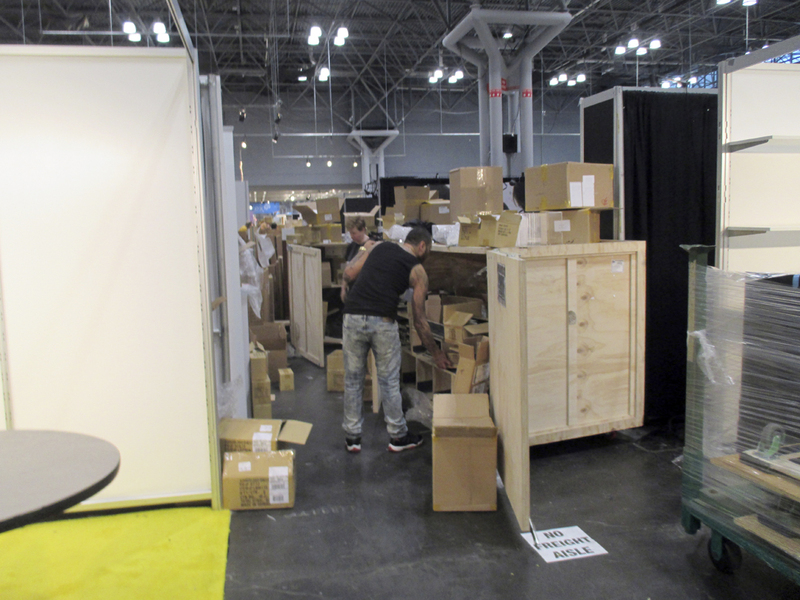 Do you want to focus and promote your artwork, and try to make a living at it by committing to this trade show–when you know on Wednesday, the ships are coming in for Fleet Week and will pass right outside the building, a monkeyfist’s throw away!? So, I’ve committed. 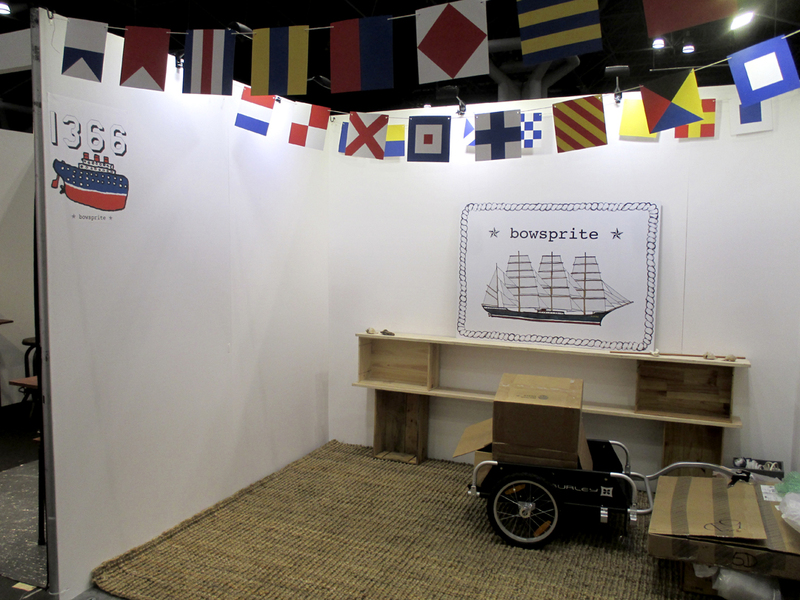 Here is my bike with all the ship cards and stationery I am presenting. 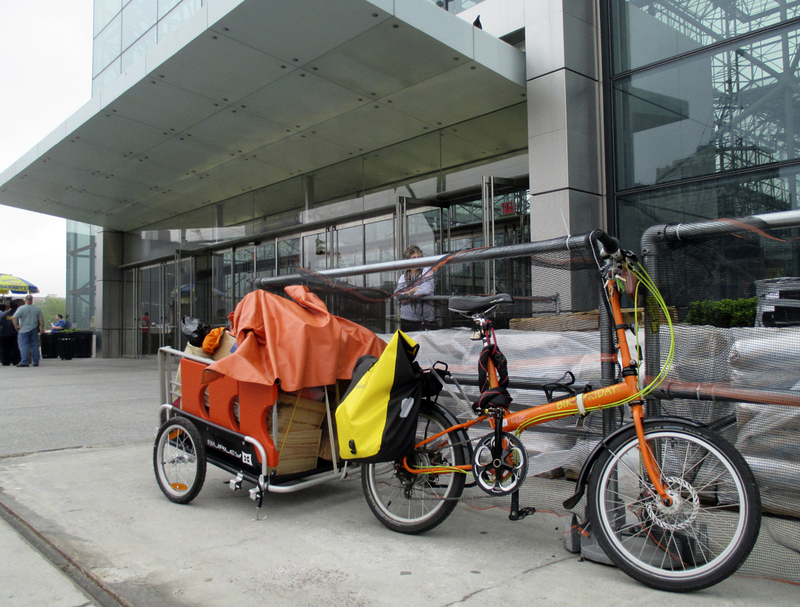 I called the convention center to say I could not find information on how to unload from a bicycle; it was all written for car and truck drop off. The fellow was amused I was biking everything, and asked: “but who will watch the bike when you are unloading?” which I found very charming. I locked it to a lamppost. I was lucky and missed the rain, but my shelving unit, coming from the flame proofers’, got extra-super, monsoon-flame-proofed. 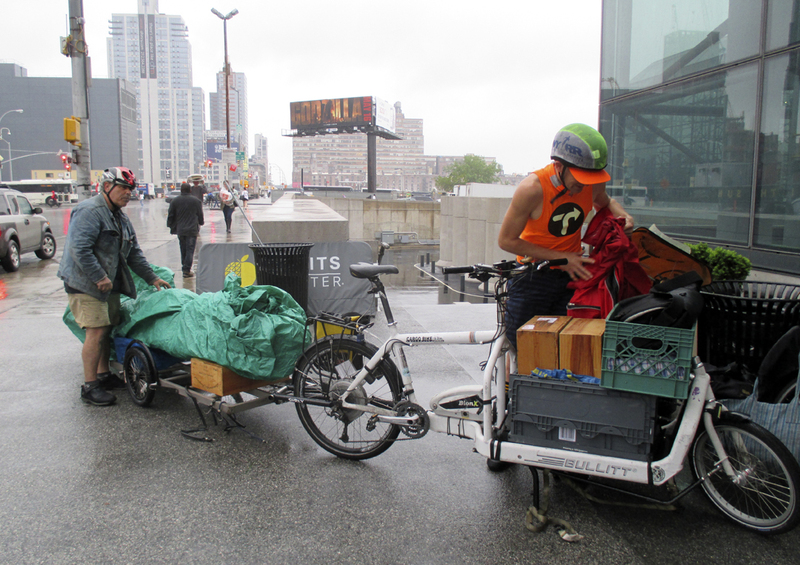 Thank you Urban Mobility Project, Shelly and Joe! It cost 1/9th the quote I got from vans and trucks, and we did not have the interminable wait times for the long vehicular congo line to the elevator in the back. 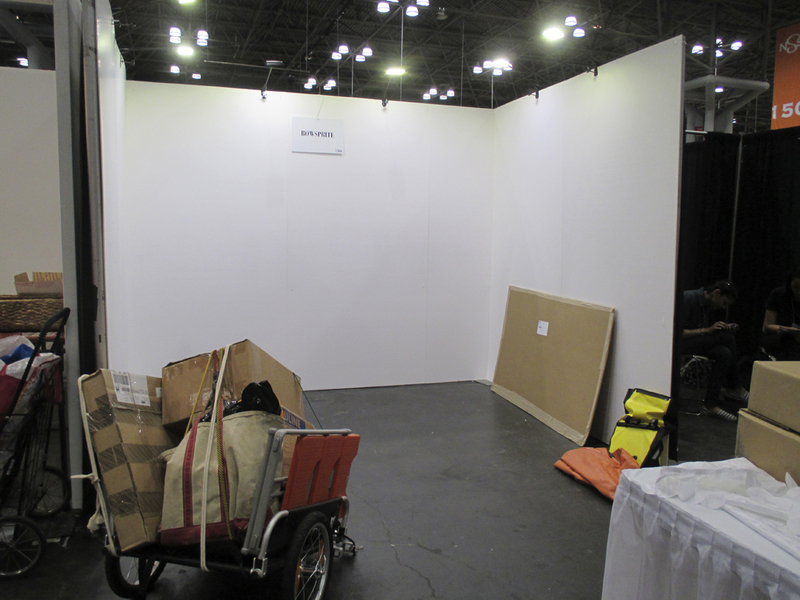 We walked everything in the front doors, exhibition hall level. Ok: so I had to spend $300 to flame proof my shelves in this modern structure with sprinkler systems. That’s fine, I did it. However, to then allow the NO FREIGHT AISLE be clogged for two days with heavy, immoveable stuffs…this would NEVER be allowed on even the more lackadaisical passenger vessels I’ve worked on. I could not get my things in. But, I was more worried that in case of fire, no one would be able to get out. The Corwith Cramer is docked at pier 25, she looks so beautiful. And, in case of fire, I am running west, and advise my colleagues to do the same. You are cordially invited to my first solo show which will open this saturday at the very cool Greenport Harbor Brewing Company! It is in a lovely harbor village on the North Fork of Long Island. 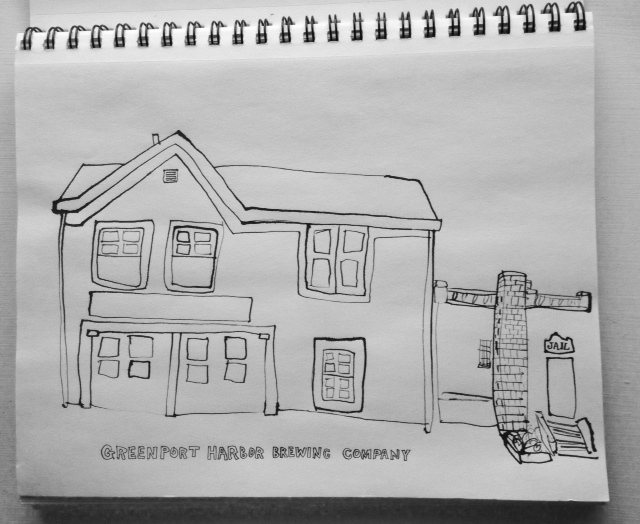 Greenport Harbor Brewing Company was founded in 2008 by Rich Vandenburgh and John Liegey. The beer is wonderful. The brewery is on the ground floor, upstairs is the gallery and tasting room. This 1896 carriage house was the Star Hose Fire House for many years. Sometimes barrels of leftover grains sit outside the building, covered with myriad happy sparrows. I met Ann Vandenburgh, who runs the gallery at the Brewery, with Rich and John at the Greenport Maritime Festival when we had booths next to each other; I was selling art, they were selling beer. The long lines were for the beer, but I was happy for the company. And Ann offered me this show back in September. Our neighbor on the other side of our booths was WPKN, a non-commercial, non-profit, all volunteer community independent radio. Starting to broadcast in 1963, PKN (Purple Knights Network) was named for the sports team back when the University of Bridgeport had a sports team. And when the University existed. Neither do today; all that remains is this fiercely eclectic radio station. Thank you, Kevin and Dave for the shout-out for the show from your station. Thanks, Ann, GHBC, and All! maybe see some of you out here east, sometime. It’s a lively, lovey village, and a deep water port! 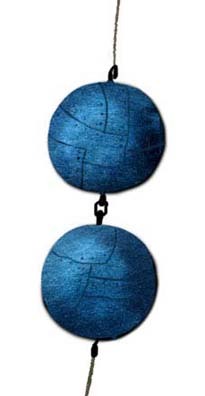 Can you imagine holding on, in the middle of the roiling Pacific Ocean, and looking down (not mentioning hostile aircraft or torpedoes honed in on your ship while you are clinging onto the rung)? Stroll south a few steps Sunday for the Working Harbor Committee Tug Race on pier 84. Where is pier 84? subtract 40, you get 46st. Pier number minus 40 will give you the street on the west side of manhattan, only. And from Pier 40 and up. Good for the few piers we have left, anyway. 10 AM – Parade of tugs from Pier 84 to the start line. 10:30 AM – Race starts – Just south of 79th Street Boat Basin near Pier I to Pier 84. 1 PM – Awards ceremony. I will be selling bowsprite art, hope to see you. Come toss a line, kiss Olive Oyl, and pick up ship schwag. Happy Labor Day weekend to all! 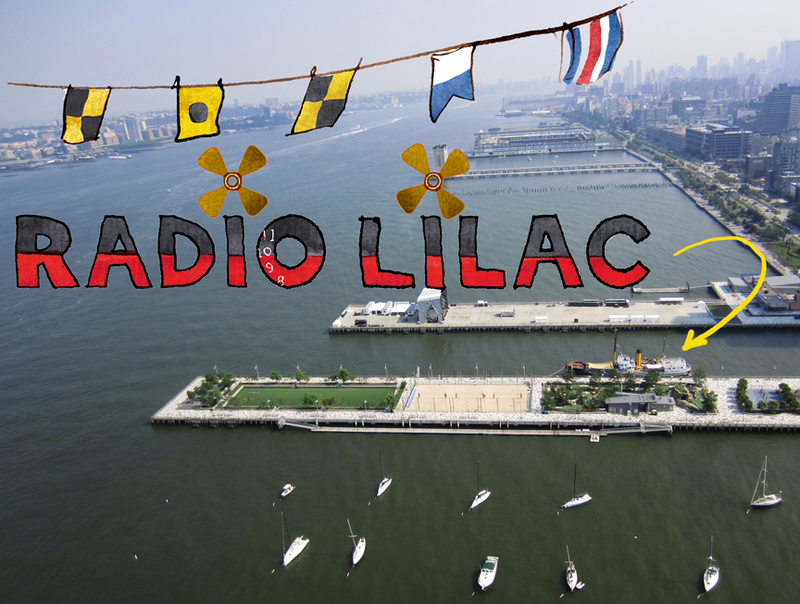 radio LILAC, next crafts’ fair in september! Bike, walk, swim, sail, paddle to Hudson River Park’s pier 25, off North Moore street and West Street. many thanks to Mary, Gerry, Andy, Sanford, Carl, Brian, Paulina, Stephen, Jimmy, Tom, Kenny, Brian, Derry (other volunteers’ names to come) for all your help. This would not be possible without all of you! Thank you, Broadsheet, Downtown Express, Tribeca Tribune. Metropolitan Waterfront Alliance (others to come). 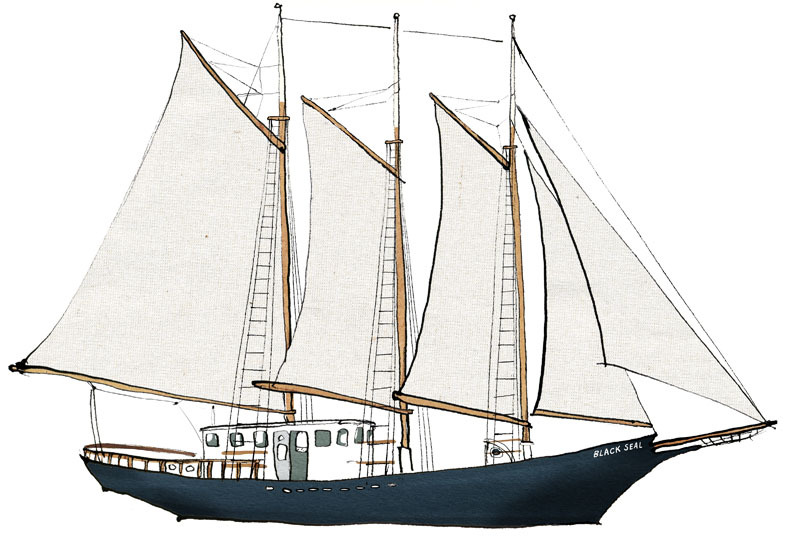 On June 14, 2011, this 70 ft schooner, Black Seal, brought 20 tons of cocoa beans from the Dominican Republic to Red Hook, Brooklyn. This is how they did it: no customs report, no bills of lading, no contract with the ILA to lift the 400 bags, and a blank stare when asked for a TWIC. Viva l’esprit of rum running! Our wise leaders decided that shooting at the handmade three masted schooner was not as good press as welcoming it, so we are happy to have the beans, Mast Bros chocolate, and this WSJ story. Will there be more? Day-o! 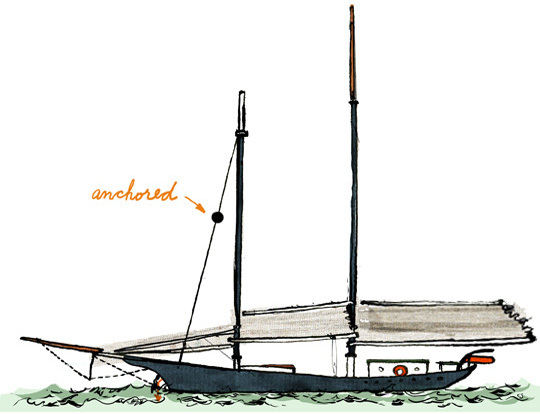 On March 9, 2012, this 105 ft schoonerbrig, running under sail power only — no motor at all — set a course from the Dominican Republic to pick up cocoa beans in Grenada bound for New York. They had rum, salt and other Caribbean products for New York, England and the Netherlands. 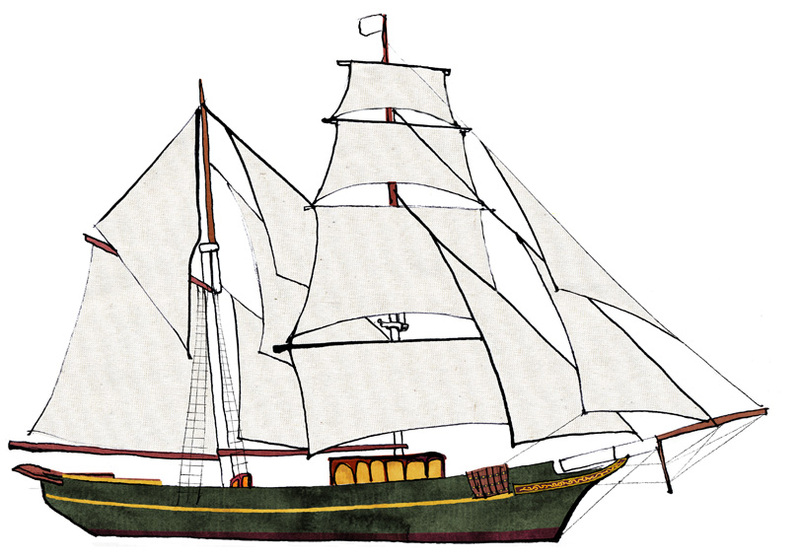 Their voyage plan had Grenada as their last Carribean stop in order to load the cocoa beans last to keep them cooler, forcing the ship to sail from the Dominican Republic against the current and close to the wind, sailing that demanded constant trimming and setting of sails during all watches. This 191 ft barquentine is the largest tall ship operated by the Indonesian Navy and serves as a sail training vessel for naval cadets and as an ambassador of goodwill for the people of Indonesia: Dewaruci. She was on her last voyage, nearing NYC for FleetWeek/OpSail 2012 when she ran low on water. She crawled like a thirsty desert traveller along the NJ coast, crying ‘water! water!’ unheeded. She reached the Verrazano Narrows bridge, and approached Sullivans Pier in Staten Island where she would tie up for FleetWeek, two days early. She was denied permission to dock. And was not allow to water. Anti Terrorism Force Protection (ATFP): the police forces were scheduled for two days later and could not be deployed so quickly, nor could they be paid for for the two extra days. ATFP does not do boat time. Desperate, the ship with their crew of 70 students looked for water, but found none. Calls were made and both SUNY Maritime and the United States Merchant Marine Academy welcomed them, eager to host the ship for two days. Fort Schuyler on the Throggs Neck peninsula was just a touch closer than Kings Point, Long Island, so the plan was to sail to SUNY Maritime to tie up and get water. The ship began the trip up the East River, when the Sandy Hook Pilots noticed a discrepancy with specs and a translation issue. 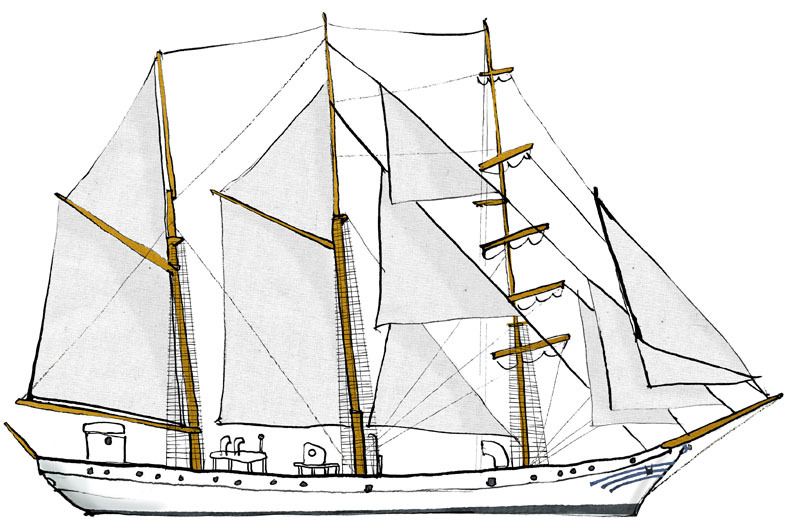 “Air draft” in Indonesian looks like “mast height” or the other way around; the mast from the deck up would have gone under the Brooklyn Bridge, but not with the ship under it. Dewaruci turned away, and limped back, still parched, to Lower Bay to wait for two days. 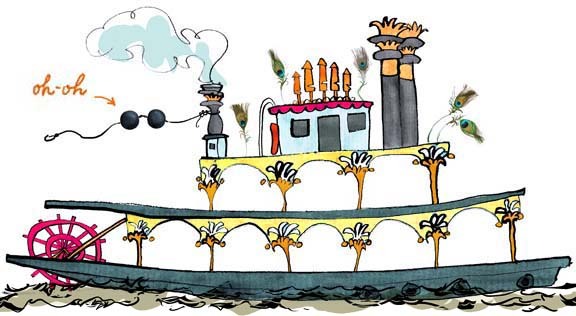 For the FleetWeek parade up and down North River, Dewaruci students dressed gaily in blue and white uniforms, and stood atop yards, on shrouds and on bowsprit, saluting a city that was a rather shabby welcoming host. O day. And there, a glimpse of the life of sailing ships at work that call, or try to call, at NYH. Tonight! the Working Harbor Committee presents “Sailing Ships At Work”: the history of sailing cargo ships, the ships that sail cargo today (short part) and what the future may look like. Ship historian Norman Brouwer, Capt. Maggie Flanagan, and Rick Spilman will be presenting. Wednesday, 10 April 2013 6 – 9 p.m. The future: projects like the Vermont Sailing Barge, Hope and Alert, HARVEST, B9 Shipping, and the MARAD initiative of the Hudson River Foodway Corridor will bring back water transportation of cargo…putting ships back in shipping. 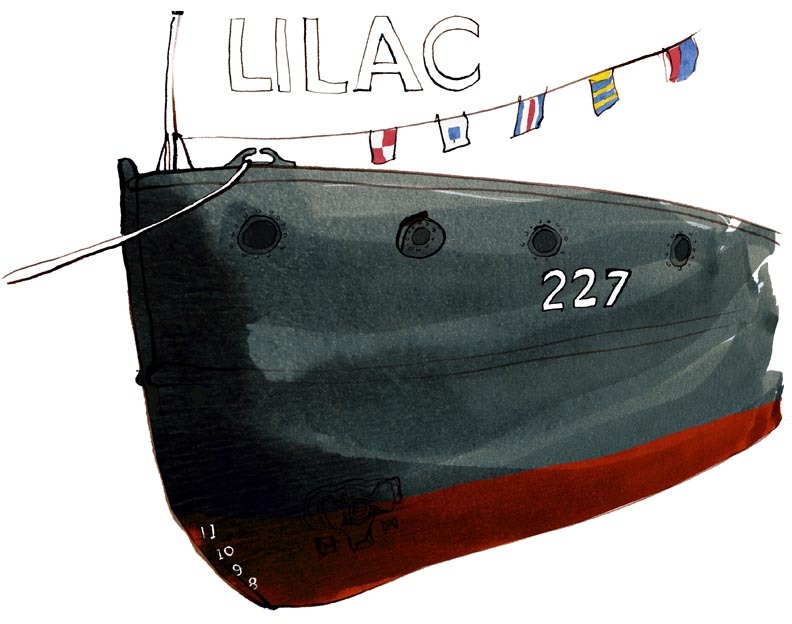 art show on the lighthouse tender Lilac! 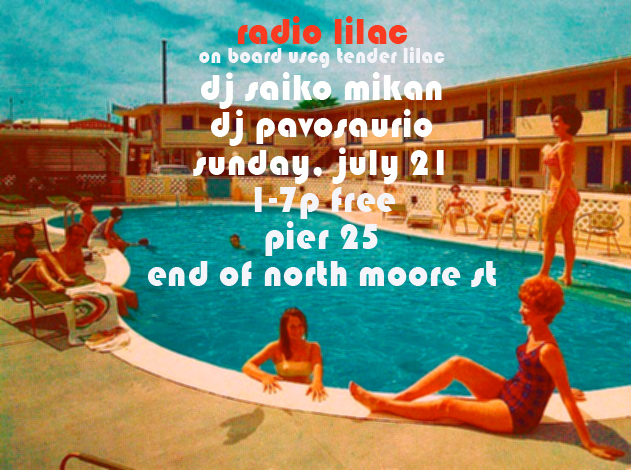 Saturdays and Sundays, 1 to 6 PM. Reception: Thursday, August 30, 6 to 10 PM. Music by the Jug Addicts! LILAC is a 1933 lighthouse tender that carried supplies and maintained buoys for the U.S. Lighthouse Service and the U.S. Coast Guard. More information about her here. We hope to see you there! Frank is there sundays, Christina will be there mondays. 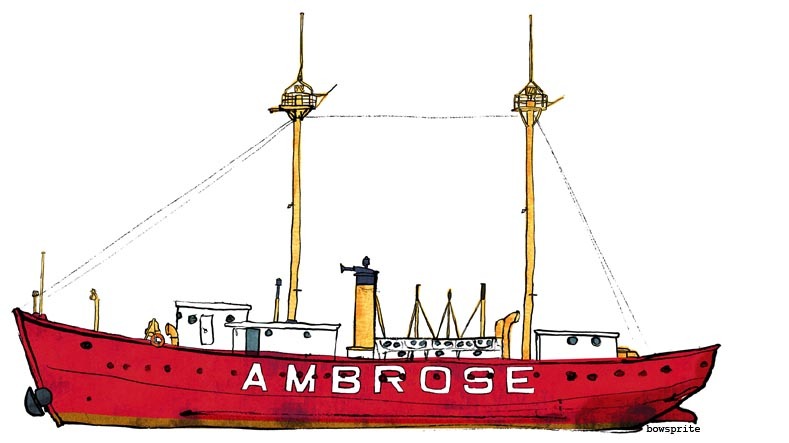 This lightship was stationed in the Ambrose Channel since 1906, guiding vessel traffic through the main shipping channel just below the Verazzano Narrows bridge, into New York and New Jersey Harbor until 1967. She was given to South Street Seaport Museum by the U.S. Coast Guard in 1968. A light tower replaced it, was hit by ships a few times too many, and, now, the channel is marked by lighted buoys. Now at the new! improved! 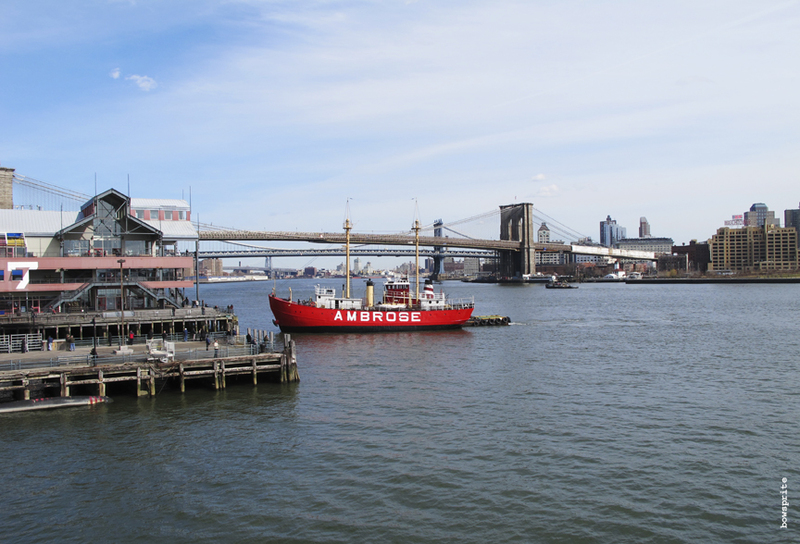 South Street Seaport Museum under the fertile wing—nurturing wing?— of the City of the Museum of New York this lightship was painted in March, and is now being restored and is open for visiting at Pier 16. The wings of the seaport museum are alive: a new exhibit is up, nautical pieces from another museum I love, the American Folk Art Museum. And true to the harbor’s spirit, the active gem of the museum, Pioneer, is sailing. Go onboard to sail in the harbor or go and volunteer and learn how to handle lines and many other things that may always serve you well…! 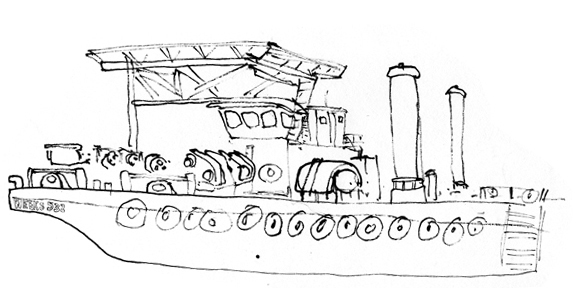 My father was estatic when I found photos online of his first ship, the Overseas Tankship Corporation vessel, Carlsbad. “How we loved the captain! We would have done anything for him. He and the officers were Norwegian. We were a crew of 40, many of us boarded in Shanghai. We carried oil and went all around the world. I loved the ship, too. I made a model of the ship out of paper and the captain wanted it. He bought it for $20, purchased a glass case for it when we were in New York, and he displayed it in the officer’s mess. “When my 2-yr contract ended, I boarded the Liberty Ship Benjamin H. Hill. We carried cargo. I was on board for only 8 months. Project Liberty Ship – cruise on the restored John W. Brown! Click on this link to see a wonderfully illustrated 1943 brochure on the capacity of a Liberty Ship. Unable to follow any rules. — thanks, Capt JJ. I think. 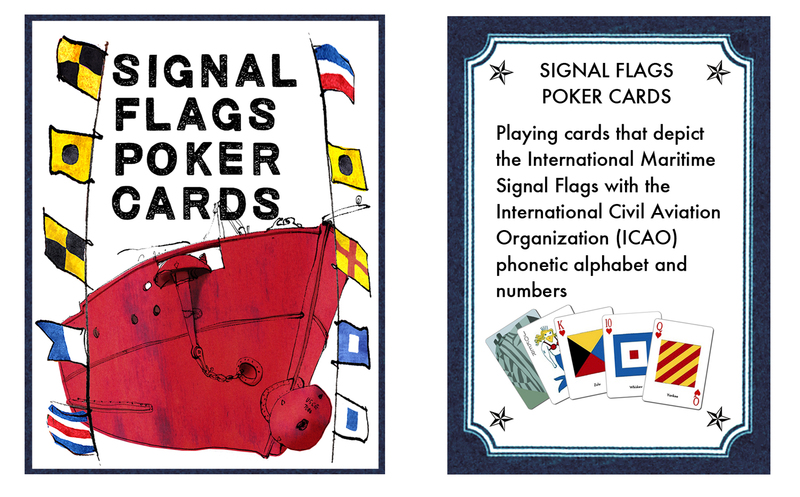 If hungry for more, the COLREGS International Regulations for Preventing Collisions at Sea, published by the IMO, spells out in exhaustive detail the rules for lights, shapes (dayshapes like these), and sound signals. 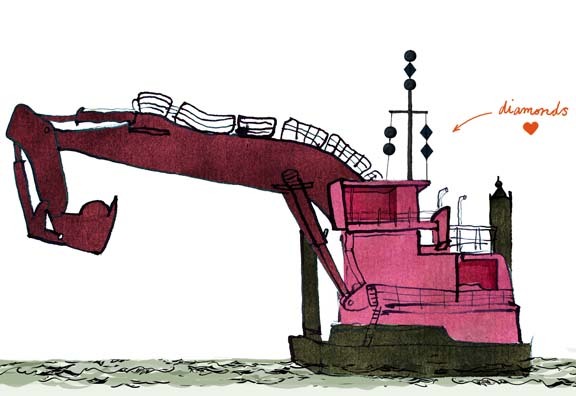 Note: *No vessel ever has absolute ‘right of way’ over other vessels. * You can be the ‘give way’ (burdened) or the ‘stand on’ (privileged) vessel. Hold written on one set of knuckles and Fast written on the other was meant to give a sailor good grip in the rigging. 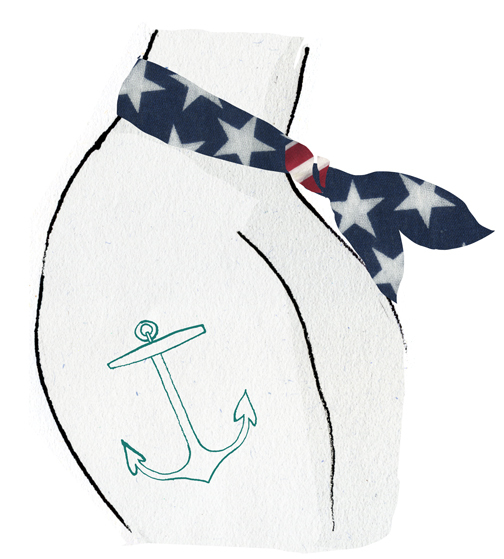 A Rope tattooed around the wrist meant that a seaman is a deckhand. 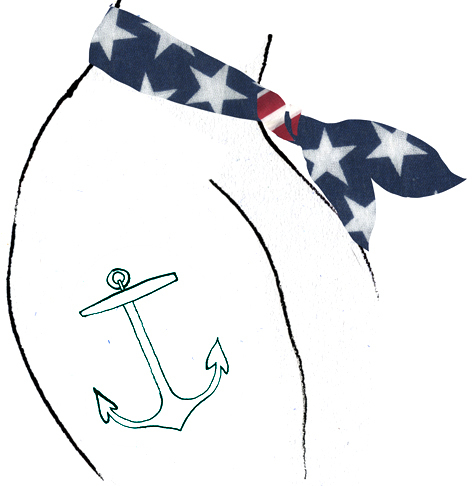 A tattoo of an Anchor told that a sailor had crossed the Atlantic, or was part of the Merchant Marines. Crossed Anchors on the webbing between the thumb and index fingers marked a bos’n’s (or boatswain’s) mate. 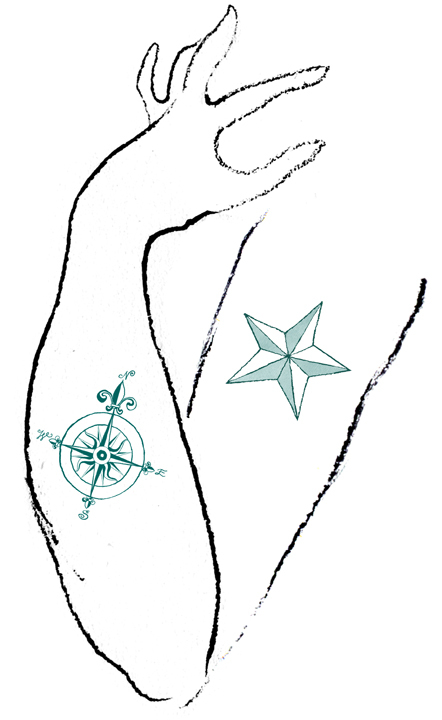 A Nautical Star or Compass Rose was given so that a sailor could always find her way home. A Harpoon marked a member of the fishing fleet. A Full-Rigged Ship displayed that a sailor has been around Cape Horn. 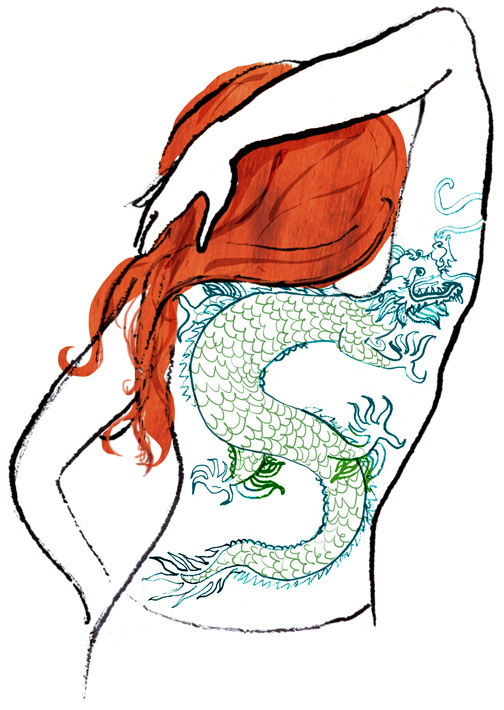 A Dragon signified that a sailor has served in China. A Golden Dragon was given when a sailor crossed the International Date Line. A Shellback Turtle or King Neptune was earned when a sailor made it across the Equator. Guns or Crossed Cannons signified military naval service. 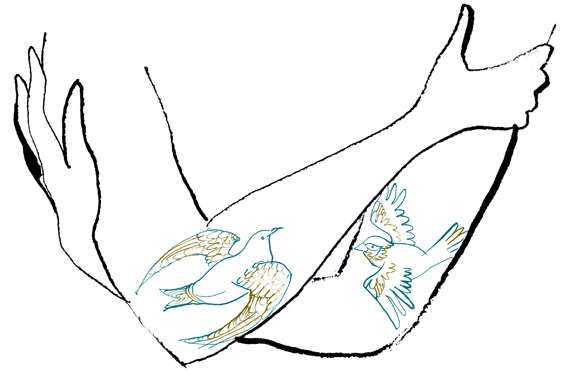 A Sparrow or a Swallow tattoo would go to a sailor for every 5,000 nautical miles they traveled–a swallow because it can always find its way home. Royal Navy sailors during WWII who took part in Mediterranean cruises were tattooed with a Palm Tree, as were U.S. sailors who spent time in Hawaii. 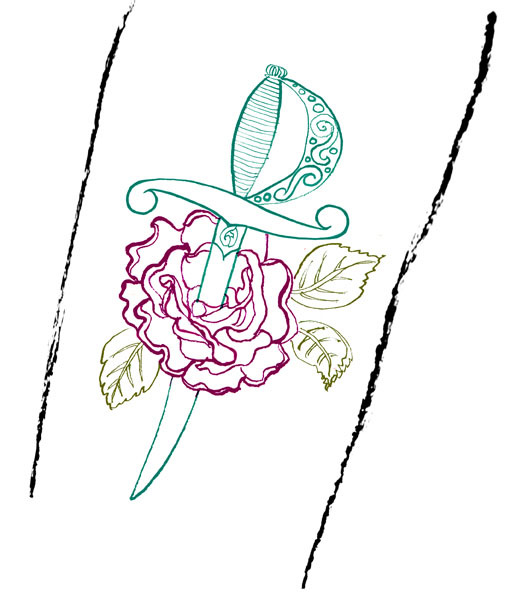 A Dagger Through A Rose meant a sailor was loyal, and willing to fight anything, even something as sweet as a rose. 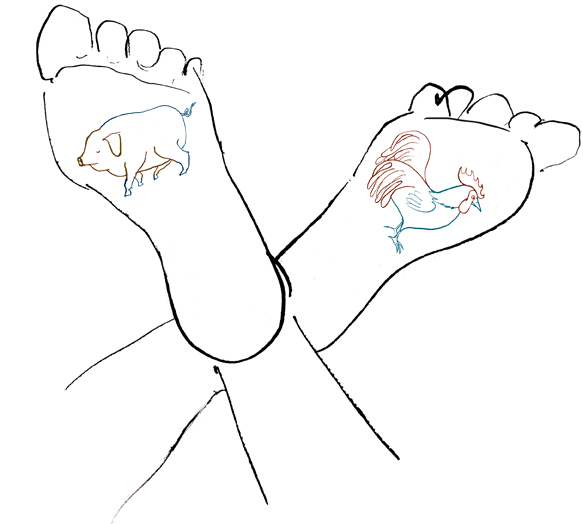 During WWII, a tattoo of a Pig and a Rooster was worn to prevent a sailor from drowning. When pigs and roosters were boarded on boats they were put in crates that floated and subsequently, often ended up the only survivors of wrecks. Crosses on the Soles of one’s feet warded off hungry sharks. Thanks, Brian and Owen of Scuttlefish! CoastLink. Thank you, David Cheslin. This post is for you. 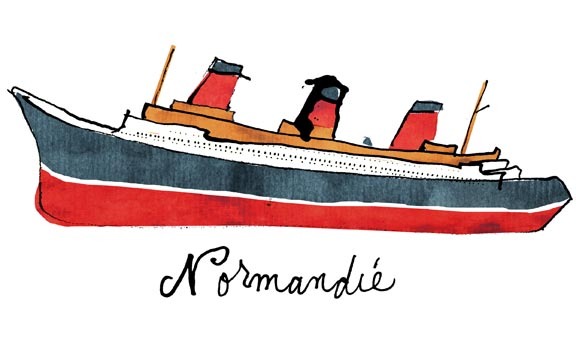 I am going to Le Havre, in Normandie, France! Builder: Chantiers de Penhoët, St. Nazaire, France. Installed power: Four turbo-electric, total 160,000 hp (200,000 hp max). 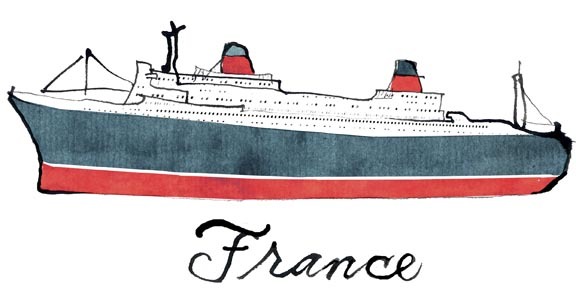 Maiden voyage: Le Havre – New York in 1935. Builder: Chantiers de l’Atlantique, St. Nazaire, France. Speed: 30 knots (56 km/h; 35 mph) approx. Notes: Cost US $80 million approx. Sail Area: 2,737 sq. ft.
It’s very easy to spot the Pioneer: look for the orange jimbuoy at the stern. 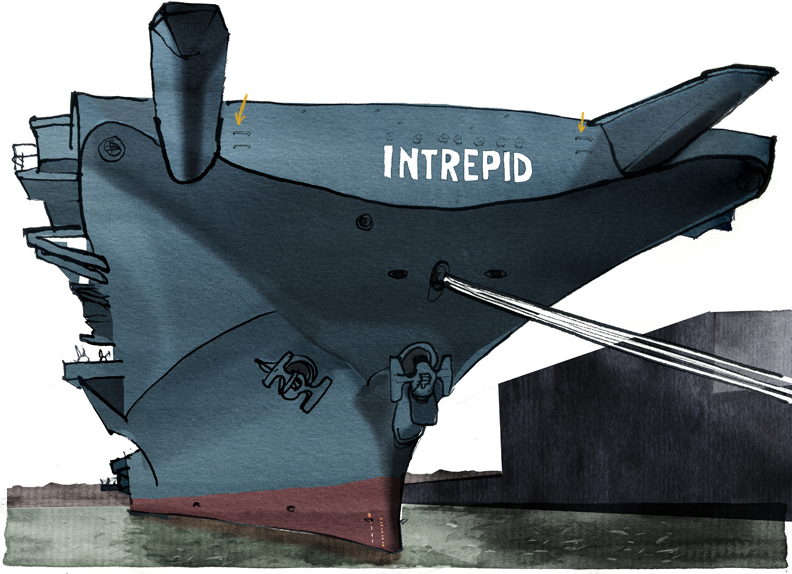 She has a beautiful bow, one of the classiest in the harbor—a clipper bow— with a proper martingale permanently cocked to starboard from a docking mishap. 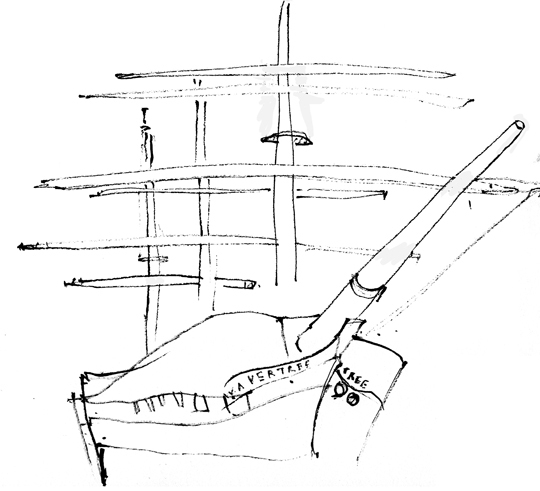 Black hull and masts, white booms and gaffs, wooden bowsprit. 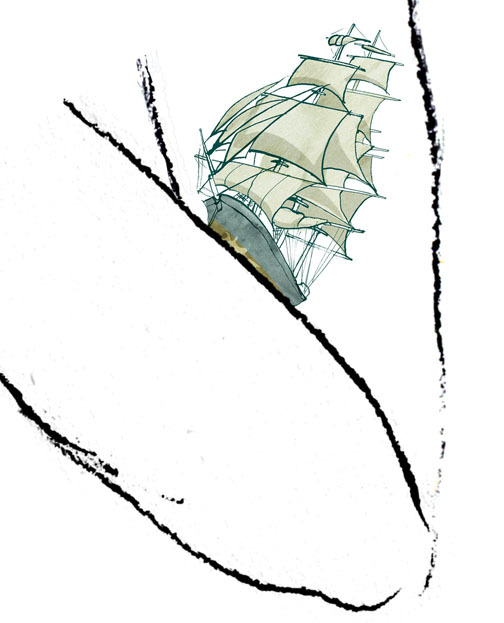 Her topsail is the grimy-est sail you would ever be called upon to hoist, redolent of grey-brown subway rats’ pelt. It’s only brought out in very light winds and training sails. 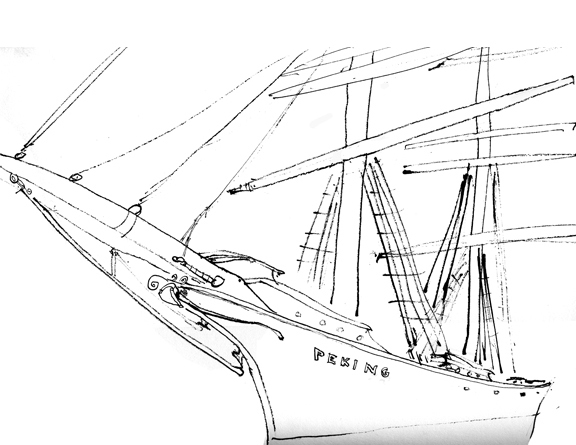 Pioneer also has a fisherman’s sail, stretched from foremast to mainmast— also a vanity sail— taken out only when the crew clamor to learn how to set it. Sail Area: 5,072 sq. ft.
Lettie, named after this seamstress, is lovely: a forest green with topsides, booms, and blocks all a buttery yellow. Look for the notch midships. I know this notch well: on the first day of my first Lettie trip, racing towards the Georges Bank, I would prop my head in this notch (only while offwatch, of course) and vomit. Wooden masts, white bowsprit. Lettie is so shipshape I believe even her baggywrinkle is drycleaned periodically. Material: Douglas Fir , cedar, teak, and mahogany. 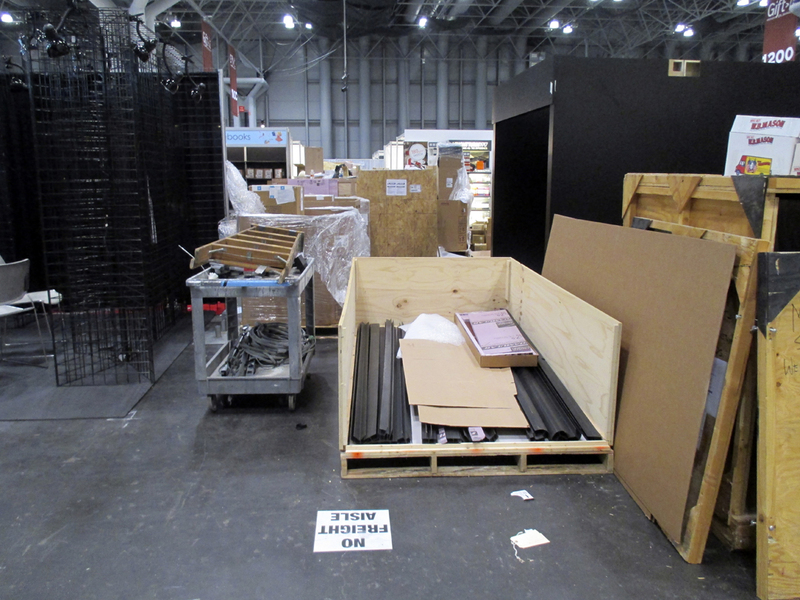 Sail Area – 2,000 sq. ft.
Adirondack’s signature telltale marks: the plumb stem and the canoe stern. White hull, bowsprit, booms, gaffs & masts. White hull, trim, bowsprit, booms, gaffs & masts of Port Orford Cedar. Sail Area: 4,305 sq. ft.
Clearwater is green-hulled with thick black trim, black masts, and has a huge white boom, white bowsprit. Very rare is her large tiller, carved in the shape of a fist. One person might be able to steer her dead ahead, but it takes several crewmembers to turn the boat. She’s still a schooner: Marconi rigged, not gaff like the others. These are some of the schooners that live here. Many friends come through: Mystic Whaler is here, at the 79th st Boat Basin, the A.J.Meerwald and the When & If, from NJ, and many others. If you are feeling the desire to own a fine schooner, this one is for sale: the Rosemary Ruth. Photos here from Tugster. Great photos and writing on Frogma: go there and type in Rosemary Ruth and Schooner Ann! 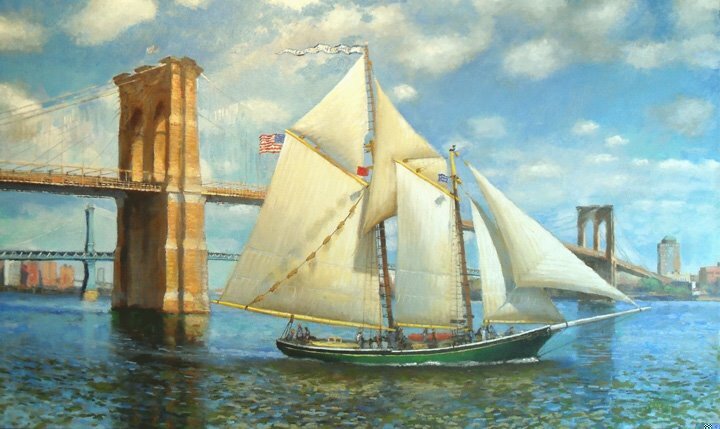 Tagged with: american pilot schooner, bowsprite, hudson river sloop clearwater, new york harbor, schooner adirondack, schooner Howard G. Lettie, schooner imagine, schooner pioneer, schooner shearwater, what ship is that? Bowsprite was born in NYC on Riverside Drive, grew up in Jackson Heights, Queens, and did not realize the Long Island Sound was just a monkeyfist’s throw away for the first four decades. Duh! But, there are so many of us New Yorkers like that, so I began this blog to show what surrounds us. Our waters are amazing! Our waters have protected, nurtured, nourished us, and still today, bring us much of what we need to survive and flourish. What is on the water? who’s out there? what is going on on the waterfront? Come to the water. Get on the water. Get IN the water! I love the old boats we have, I admire the knowledge of people who know how to fix, maintain, and run some of these boats and ships. I admire the working harbor, and I’ve been lucky to find a little boat to work on, a little orange hydrosurveying vessel. There is a vibrant community of what Tugster calls “the 6th boro”, and it is thanks to them that I learn of the things that I record. 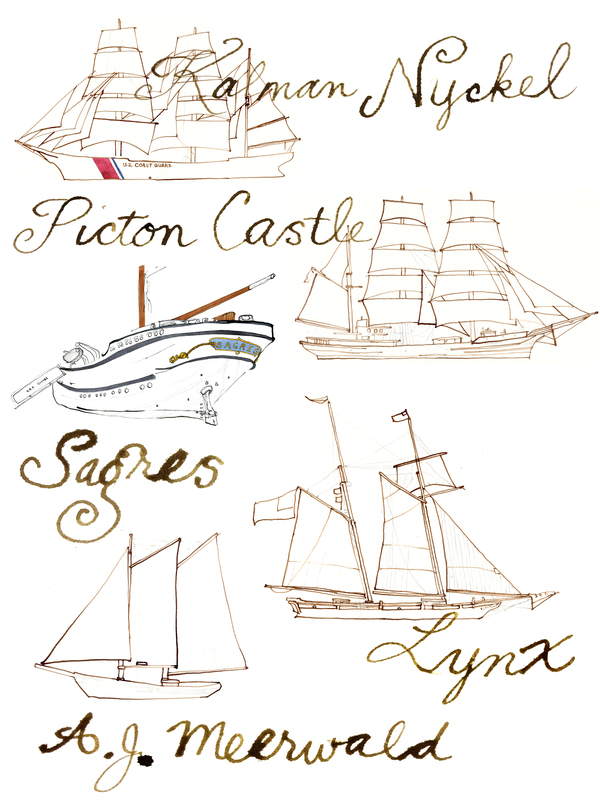 I love ships, I love stories, I love the water, and with this blog, I get to combine it all! I got into this watery world quite late. It began with the books of Jacques Cousteau, Dr. Eugenie Clark, Patrick o’Brien, but really became an obsession when I joined a team of swimmers to swim around Manhattan, and studied my first chart. I owe much to the people I’ve met who work on the Pioneer, Peking, Wavertree, & the Michele Jeanne who generously pass on their knowledge, passion and friendship. This doodle is of a tin toy, a German christmas ornament. 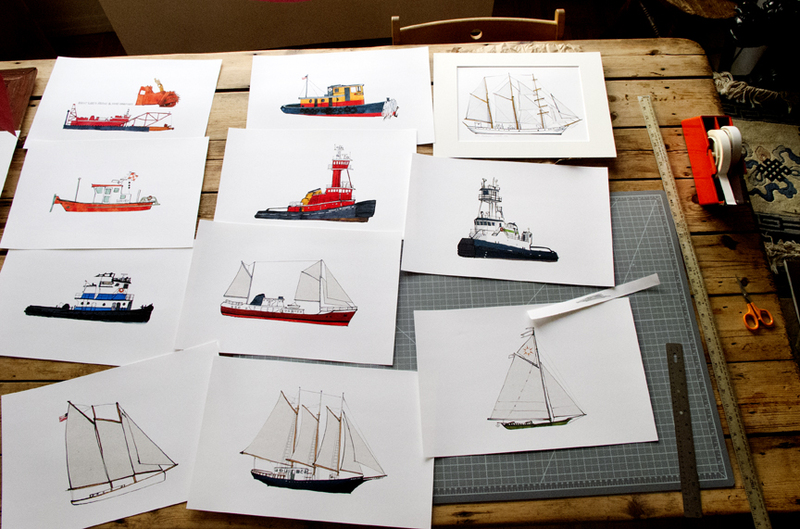 It dangles from my lamp, over a large pile of drawings of boats and ships I hope to post up soon! Thank you for checking in! Thank you, Elizabeth and Will for helping me to begin this blog! Thank you, Dr. Wanderson, for the tag, Bowsprite.